ABSTRACT: While eradication of invasive mammals from islands is now almost routine, with well-established protocols, methodologies for the eradication of birds lags far behind. The Common Myna has been introduced to oceanic islands throughout the tropics and studies on Indian and Atlantic Ocean islands are beginning to suggest promising tactics and highlighting problems, centred largely on human attitudes and resourcing. BIO: Chris Feare has studied the management of birds that conflict with man’s interests or are exploited by man in many parts of the world but especially in the Indian Ocean. 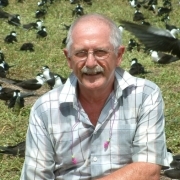 Current work centres on the sustainable exploitation of Sooty Tern eggs in Seychelles and the problems caused by, and eradication of, various introduced birds that conflict with conservation of endangered endemic birds on those islands.